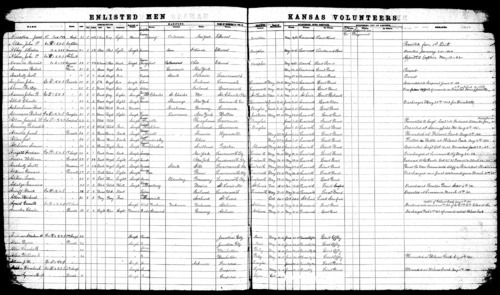 Roster of Civil War soldiers in Kansas volunteer units. Entries are arranged alphabetically by company and size of units. Although labeled "enlisted men" the volume contains officers' names as well. Information includes description, marital status, nativity, residence, muster information, and remarks. See Kansas Memory unit 226678 for the index to this volume.